Well, here it is, the final installment in the Harry Myers interview. 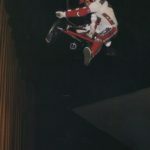 This is the part where I actually really got to meet the guy 1987-1989 and sorta be there towards the end, lol, the end of General and the end of the beginning of freestyle BMX. 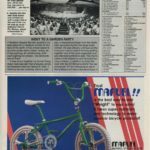 I scoured some of the old mags and found a couple classic General ads with Steve Rulli, Pete Kearney and the infamous General Scooter in them. Harry goes into all the freestyle stuff here and sorta gives us RL’s vision of the future of BMX as he saw it in 1988. Which if you were watching X-Games 14, finally came to life this past weekend. 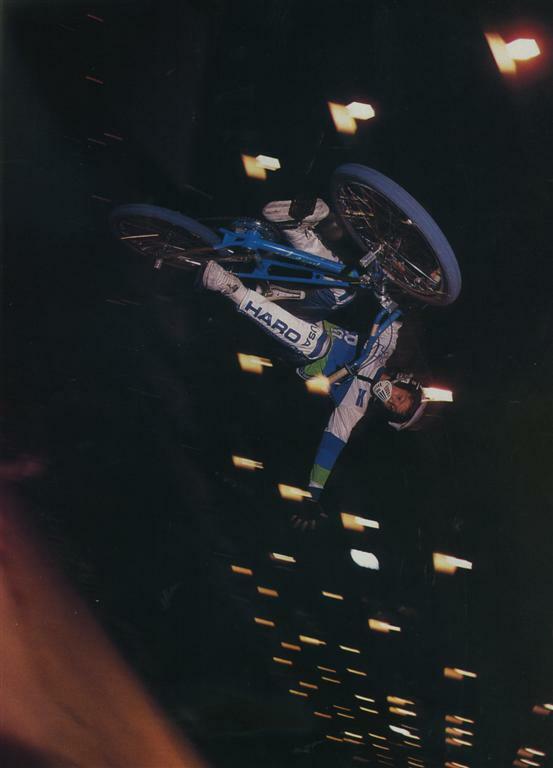 To me Harry was a good guy who was there trying to get things going in BMX at all it’s stages, I gotta say it just would never have been the same without him. Here’s the final installment in the Harry Myers interview. I guess I’ll leave with the now famous Wilkerson quote modified for this… There will never be another first generation of BMX promoters. Harry Myers, the General Bicycles years. And then I hear about freestyle and I’m thinking, and anything I wanted to do they let me do, because the bike line took off immediately. 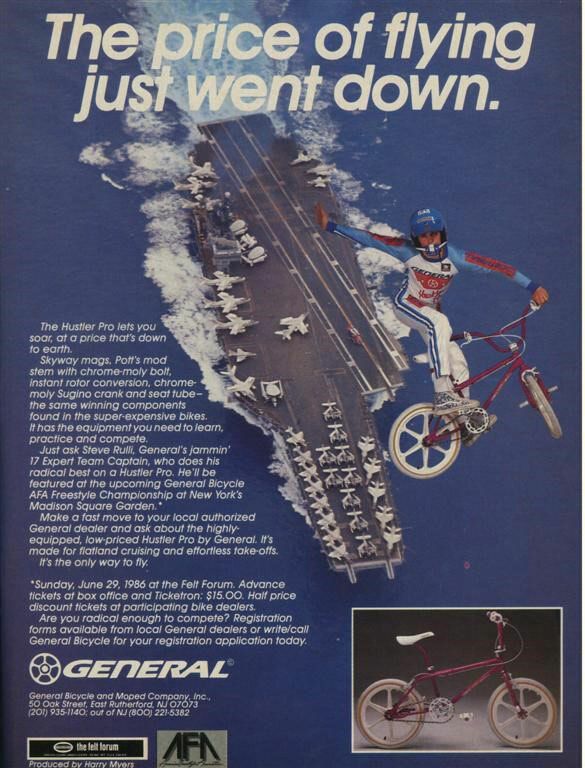 General now had a bike line that gave bike dealers a chance to compete and it took a long time before other companies jumped on the bandwagon and did the same thing. But they listened when I suggested the freestyle line. This is a growing sport I like the idea. Let’s start a little freestyle team and we did. And Steve Rulli was one of the original members of it, it really wasn’t a fancy team. But what we decided we would do, is we were going to put on an event at Madison Square Garden. They looked at me like I was out of mind. They said Harry, Do you know how much it’s gonna cost us? I said yea, but think the name General will be all over the place and it will really start to grow and then we could see if we could get some pros. The biggest objection I had was that the name “General” sounded so lame. I wish we had a different name, ya know General was like a generic name. But Slifka said nope, General is the name and it’s gonna stay that way. I mean ya know we coulda picked a cool name for freestyle. At that event we saw a lot of different riders. One of them was Matt Hoffman, he came, flew in with his dad in a private plane which just blew everyone away. There was whole bunch of interesting personalities that were there. Fred Blood was one of them. We didn’t think he was the best rider but we thought he would be a really good promoter. So we asked him if he would be interested in being sponsored and he jumped at the opportunity. He didn’t have a real sponsorship at the time that was worth anything. And RL Osborn who was very well known, we spoke to him too and it was a tough negotiation and it cost us 100,000.00 a year to have him. Plus all of the equipment for his tours, we bought him a dualie and a trailer and it was insane, but it paid off for awhile, because General was doing well. But freestyle started to fade out and the competition became very, very intense. Our arch rival was GT. They were bent on getting us to be humbled to them and they were very good at it. They spent a lot of money competing. But none the less freestyle did change and General kinda was getting a little mismanaged maybe because they listened to me too much and spent more than they had or then they wanted to. There were times when they were putting money into this business that really wasn’t justified just to keep it going until finally they came to the realization that it’s not profitable anymore. It just wasn’t profitable. So we had to dismantle a lot of things that we had. One of them was no longer keeping RL Osborn. The one that really broke my heart was firing Tinker Juarez. Who got started with us as a mountain bike racer, who blew everyone away over the years. I don’t know if he still races. 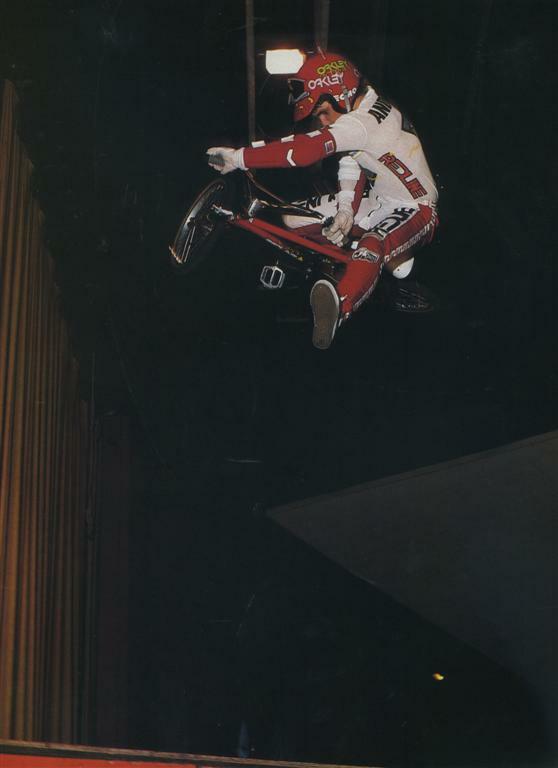 (Yea, we discussed Tink, and his AWESOME career, and yea guys and gals, he started with General on the mountain bike scene and of course started with….BMX) But amazing things had happened that hurt us but none the less were necessary. But the legacy of what General left behind was the fact that it was a group of people, it wasn’t just me and my cheerleading for the company and all the promoting I did because that was my job it was the fact that they honestly believe there was a business to be had there if you go about it properly. And we tried. What was your position at General? I was the director of advertising and promotions. I also maintained a territory, that gave me some serious additional income because they gave me a commission. And as an example because New Jersey and Long Island was my territory when the scooters came out I was getting commission off all that stuff. Back in 1985-86 just from the scooters alone in one month I made like $14,000 dollars in commission just from that, that was separate from everything else I was earning. So I was a busy guy at that time. I kinda miss that, LOL. Now I’m living a nice modest life in the country out here but, back then things, things were good for awhile. It’s like anything else you know, you have your peaks and your valleys. You enjoy things when they are good and when they are not as good as they used to be you still appreciate what you have. People are very resilient; we can adjust to a lot of different levels and lifestyles, if we’re cool about it. (At one point, Harry asked where I was living and I said it was a town over from Point Pleasant Bicycles which led to …scooters) As a matter of fact had it not been for point pleasant bicycles, remember the scooter? had it not been for him, who happened to have one of the mongoose scooters in stock at the time that wasn’t selling. I looked at it and said well, this thing just needs some improvement and if it’s improved upon and marketed properly it will sell. I actually called Skip Hess who was the owner of mongoose at that time, I said Skip and I knew him pretty well from previous things in BMX, I said “do you mind if I innovate your scooter a little bit by copying the basic design and adding a few things?” He said, “Harry, if you can do anything to get my scooters to start moving, go for it”. And that’s when I started, at that time neon was popular so I started using neon colors, turn em into little freestyle scooters and all of a sudden they just took off. Yea so I got the idea for the first time when I saw the scooter at Point Pleasant Bicycles. 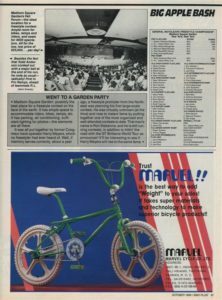 We even used the velodrome in California and put on the F1 races, using that little hybrid, that little 10 speed or 12 speed BMX bike. I’m not sure if everyone remembers that, it was a very brief period. And I remember the editors of the major bike magazines asking me, Harry why are you pursuing this? This is not going to happen. It’s just not there. And I disagreed with them, I mean I thought with Shimano making components they would really push it, but they didn’t. And that was the end of that. don’t even remember if we had a ¼ pipe at that time, I think it was all flatland stuff in the beginning. (I mentioned seeing them at Beacon Bikes for a pre-show for GT with Steve Rulli and Pete Kearney) Oh, we had a team even before that. The original team, I think, consisted of Steve Rulli, who was not really part of Pete Kearney and Brian Belcher and Mark Roldan, they came a little later after Steve. I remember one of Steve’s friends, one of their names was Josh, and these guys were real…beginner to intermediate level, it wasn’t until we were introduced to some of the better riders that were at the intermediate to expert level that the team took off and we started getting the pros. That’s when we had two national tours running as well. One was Fred Blood and one was RL. The RL one was really the big one because he was so well known. The Fred Blood one was secondary but it did travel all over the country. And then we had the local teams that did the local bike shops. From time to time I did have to travel out to some of the events or accompany the team, but I didn’t do much traveling. I was too busy doing a lot of other things at the time with General. Where did the General equipment wind up? A lot of the stuff was just given away. When the company finally broke up, whoever had what they had could keep it. RL had his stuff, it was his to keep, we never asked him for the truck back or anything like that. The other stuff, the stuff that went into the trailers…I honestly don’t know where that wound up. They may have stayed at the warehouse for all I know got stored there and died there. One thing about Robert Faganson who was the chairman of the board of the company he was a very generous guy and he gave everything away to anybody who asked for it, he gave me the t-shirt machine. He said Harry, you can have it, what are we gonna do with it. Make t-shirts if you want to for the fun of it. He gave me the generator that was used for the PA system. He said what am I going to do with this stuff, ya know we’re not gonna auction any of this junk off, keep it, it’s not worth our time to do that. (I always remembered Harry as being smiling and pumped on BMX everytime I met him, I mentioned this to him.) Ya know to tell you the truth, I was very sincerely pumped up because I don’t think that many people were as fortunate as I was to have a career in a business that I truly enjoyed. Where every day was a new adventure and exciting and challenging. I would get up in the morning and just be ready to take off from the starting gate and just go full bore from start to finish every day. That’s how it was and I still can’t believe the enthusiasm I had. The day that I went to Craigmeur and gave my proposal was one of the worst snow storms we had. Here I had to climb this mountainous area in a Chevy Monte Carlo, I must have spun out 10 times before I even got there. I barely made it, but I was so driven to get this sport off the ground that I became unstoppable. It’s amazing what enthusiasm can do. Now if you put me on a snowy road, I won’t even get behind the wheel! LOL! Now that I think about it, now would be a great time for me to do that again, lol. Because, here I have pretty much retired with a few projects that are fun but plenty of spare time. I mean I’m basically retired, I don’t work for anybody. I just do my thing. I’m 66 years old, but I think, maybe it’s the number, I don’t know, 66, ****, golly ya know I get pumped up on the things I’m working on from time to time, but to have that day to day enthusiasm is just not the way it is. I enjoy being a grandparent and just doing things that are a lot more mellow. 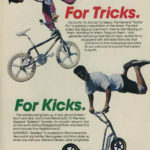 But anytime I see BMX, I think back and the history of it, the people that were involved and these legendary names that these people who are older that are gone. 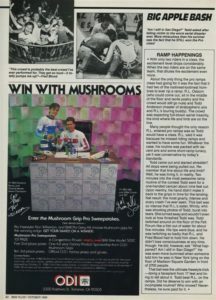 Like Chuck Robinson who had Robinson Racing Products, and Skip Hess who is older than me, his son Skip Jr. became a very prominent figure in the bike business. And people from GT, like Gary Turner when he got started with the company and the people that succeeded him, a lot of these people are gone. They’re not even alive anymore. I must say for some who was very laid back he made quite an impact and that was Ernie Alexander from the NBA. How do you feel about BMX now? To see a sport endure over the years, become an Olympic sport. To know that the kids that were racing back then are now adults and in many instances parents of kids that are now involved in the sport, is, it’s just nice to know. you want to. Out here you can have a concealed handgun license all you have to be is an upstanding citizen without any arrests and you can carry a gun anywhere you go at all. So, I’ve been working on a holster that can be worn in hot weather, under a regular shirt and shorts where a person would never even know that that person has a gun on them, and they tuck their shirt in if they want to. Also because I love animals, we have been developing a line of dog cookies. Harry has a 15 year old mix between a corgi and a healer, they look like an Australian cattle dogs. What excites me is the fact that BMX had its ups and downs and it’s come back now and it’s still a very viable sport. 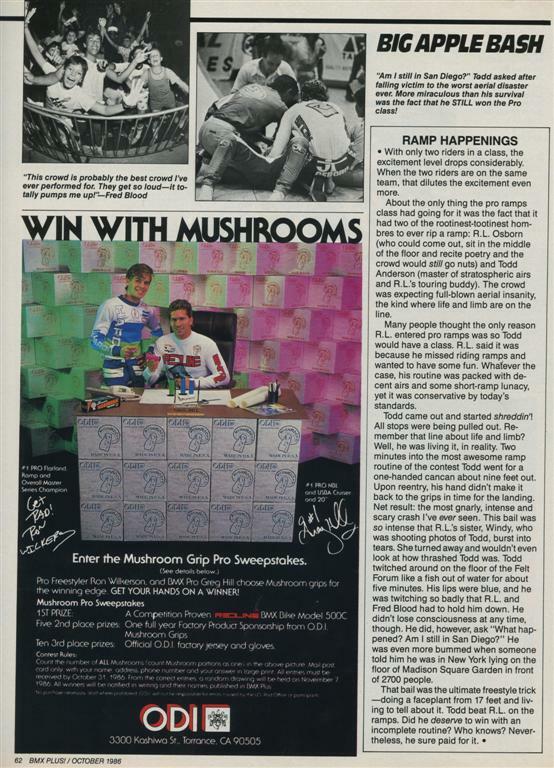 And that’s good news, after 30 some odd years, I mean the proof of the pudding is we are gonna see it in the Olympics! 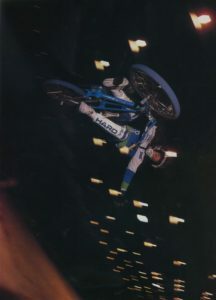 (At this point Harry asked me who was the major organization that got BMX into the Olympics, so I gave him the whole sordid run down of events) We talked about how BMX racing at the local scene has sorta gotten to put it kindly, “soft”. I told him how our largest track of which there are now only 3 gets only at best 100 riders on a local weekend. I also spoke to him of some people’s unwillingness to properly promote it. He had this to say about promotion. 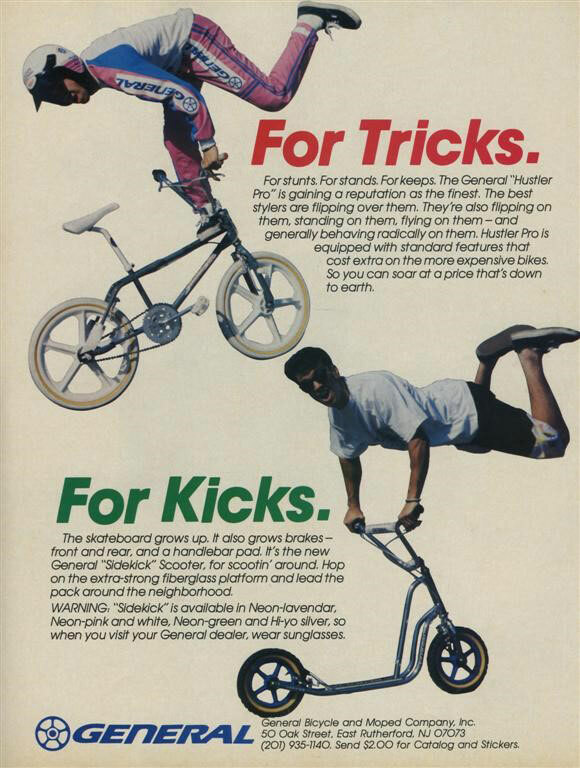 What did Harry know about the future of BMX 20+ years ago? One thing I should mention to you and that was a comment RL Osborn had made. Which was very, very prophetic. 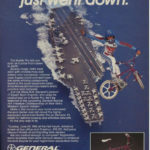 When freestyle BMX as a competitive sport, the way it used to be, started to slow down. I told RL, ya know this sport is beginning to lose its impact, you know…what do you think the future is? He said Harry, mark my words, over the years, you’re going to see freestyle transform itself into a street sport. It’s gonna become street. (Anyone just watch X-Games 14?) You’re gonna see kids doing more stuff on the street the way they do with skateboards than what they are doing now. They’re not going to be doing it just to be able to compete at local events. They’re just gonna do it, just for fun. There will be those who will be stand outs who will become pros and be very well known. And he was right! He predicted what was going to happen over the next 20 some years. RL in his time, he was pretty amazing. RL at the time he was riding he was already 26-27 years old, so he is now somewhere around 50 years old. That’s hard to believe! It’s nice to be able to look back at times and know that a whole generation had passed but the sport still exists and maybe the best is yet to come. And after China it may very well be the case, depending upon how much play it gets on TV. The thing that I am most proud is not so much that I helped create the sport in New Jersey it was that the sport that I was involved in, is still alive and that it was passed on from one generation to the next. That to me is more important than the creation of something; it’s the legacy of knowing that something you were involved with was good enough to continue. More so than, “it was good in its time” That’s something that I hope will endure, I’m sure it will still have its peaks and valleys but that it will keep on going for another hundred and some odd years. 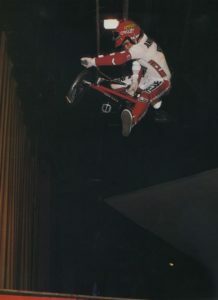 And ladies and gents that is Harry Myers take on the beginning of BMX and BMX freestyle in New Jersey. Knowing the guy well from the freestyle years, I felt as though he would be a good touchstone to begin the big interviews of looking back on the great history of the sport in NJ. 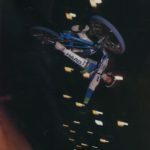 Yes, there are many others who will be interviewed and asked about the past, and there are even those who came before Harry but I feel as though starting with someone who bridged the beginning of BMX racing to the beginning of BMX freestyle was a good place to start. 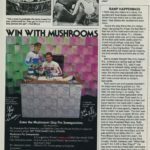 I hope everyone got some enjoyment out of this article at the very least and maybe, someone, somewhere out there, might be a little inspired to go for what the men of the 70’s and 80’s went for and start their own track or company.